Click on Image to see logo on backside. As most of my regular customers know, I only sell products that I personally use and like or those that trusted fishermen and customers prefer. This product checks all the boxes. 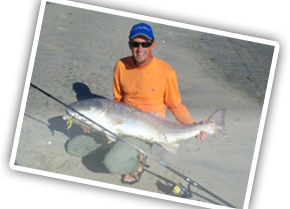 I have personally tested and fished the OTW Sandsticks and they are the best I have used. 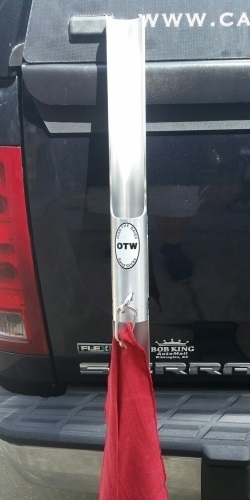 Constructed from 6061 Aluminum, both tube and angle are tig welded, with a zinc galvanized eye bolt to hold aluminum snap clip and signature red rag. The tube has a quick release cut out, and they range in height from 56 to 58". There are NO SHARP EDGES (all are beveled) to cut or damage the handles on your nice surf rods.